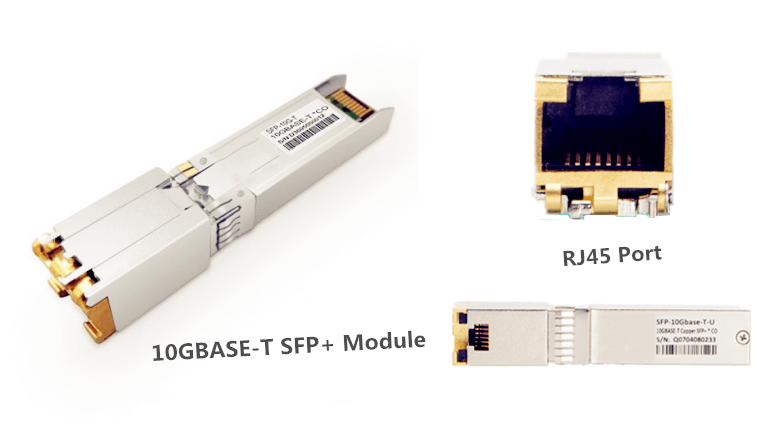 10GBASE-T SFP+ Copper Module up to 200m – Is It Possible? The introduction of 10gb SFP+ copper modules made people rethink 10G optical network, and was treated as the thrive of copper cabling. Vendors like Cisco, HPE, Amazon, prolabs and FS.COM provides 10GBase-T SFP+ module around $300 with 30m linking length and 2.5W power consumption, but it is a controversial and expensive copper devices. Today’s article decodes the 10GBASE-T SFP+ copper modules that can support up to 200m, and auto-negotiate to 1G, 2.5G, 5G data rate. 10GBASE-T SFP+ transceivers, terminated with RJ45 connectors, allow 10G bandwidth over existing infrastructure and reuse Ethernet cables. However, owing to the high price and unstable performance, 10GBASE-T is not usually the type when competing with cost-effective DAC cables, and reliable SFP+ fiber modules. Customers use ideally DAC twinax cables for shorter reach transmission, or if they need longer distance, they would go for fiber SFP+ or SFP+ AOC cables. 10GBASE-T can auto-negotiate to 5G, 2.5G, 1G, 100Mbps, 10Mbps data rate, which is the highlight of this product. For 2.5GBASE-T/5GBASE-T networks, you can use this module. Is It Possible to Support up to 200m? The regular 10G copper modules launched by fiber optic vendors are specified to support up to 30m over Cat6a/Cat7 cables. According to wikipedia, 10GBASE-T, or IEEE 802.3an-2006 standard is released to provide 10G connections over unshielded or shielded twisted pair cables, with distances up to 100 meters (Cat6a), 55m (Cat6). What’s more, 10GBASE-T cable infrastructure can also be used for 1000BASE-T allowing a gradual upgrade from 1000BASE-T using auto-negotiation to select which speed to use. Therefore, 10GBASE-T copper modules can auto-negotiate to lower data rate e.g. 10 Mbps, 100 Mbps, 1 Gbps, 2.5 Gbps, 5 Gbps, 10 Gbps. A new type 10GBASE-T SFP+ from Mikrotik can support all the above five data rates over different link length. The max power consumption is 2.4W, and can only be used in SFP+ ports. Table 2 shows the 10GBASE-T Cable Types and max supported lengths. According to the above table, we can see that it can reach up to 200m over 1000BASE-T network, or at 2.5G 200m using Cat6a STP cables. So please be mindful of where you want to use them. Isn’t 10GbE Copper Power Hungry? 10GBASE-Cu DAC twinax cables consumes 4-8 Watts power during the operation, while SFP+ 10GBASE-T copper modules draw less (2.5W), and it is not a standard compliant transceiver, hence the shorter distance of 30m. But if dig deeper, we will find that if there were more power, they would use it. So, in order to be fully compatible with 10GBASE-T standard, you need more power. Today’s fiber SFP+ modules like 10GBASE-SR draw less than 1W, much lower than the 5 to 8 Watts per 10GBASE-T port. Drawing an increase in power by a factor of 5 can seem like an expensive upgrade cost. When factored against servers that can draw up to 1000W or more, the overall proportion is low. For small to mid-sized (SMB) organization switch-server installations, short reach cable runs of less than 45 meters will apply and use even less power and therefore cost less. Although fiber becomes popular with the benefit of delivering flexible cabling, lowest latency, many IT departments still adopt copper cables for switch-to-switch or switch-to-server connections in 10G Ethernet applications. 10GBase-T Copper SFP+ is backward compatible with Fast Ethernet and Gigabit Ethernet and can automatically negotiate to lower speed connections. More importantly, 10GBase-T provides a cost-effective method for migrating from your current network to 10G Ethernet by utilizing your existing RJ-45 copper short connections. Amazon, FS.COM, Prolabs, Mikrotik and HPE supply 10GBAST-T copper transceivers, you can get what you want from them.